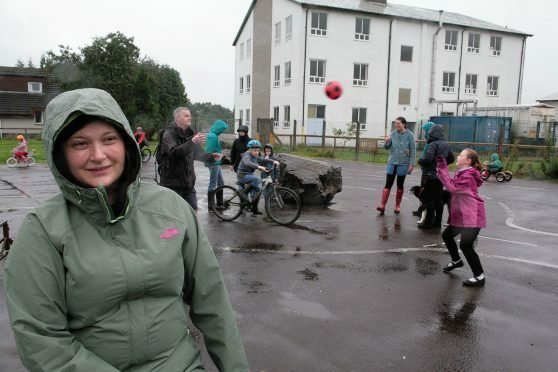 People living close to a former Lochaber school are concerned that plans for a 70-home development on the site could result in the loss of a play park and the creation of a rat run. Artist’s impressions and information on the joint Highland Council and Lochaber Housing Association scheme are currently on show at Caol Community Centre until Friday October 7. And local people were angry to discover that four of the new houses on the Lochyside RC Primary School site, near Fort William, were on a popular playground. They have also pointed out that opening up Castle Drive to provide a secondary access to the development would turn what is at the moment a quiet cul-de-sac into a busy through route. Carol Gosling, of Castle Drive, who has two boys – Robert, aged 9, and six-year-old Douglas – is angry that they could lose their play park and worried that the road would become more dangerous due to increased traffic. The 37-year-old mother said: “It’s a cul-de-sac at the moment and it’s fantastic. “It’s almost like a square of houses around a grassed area, then there’s a tarmac-covered area, where the council has put boulders in and painted fake white lines like roads. She added that she was well aware of the need for affordable housing in Fort William so supported the scheme, but did not want to see Castle Drive used as an access road or houses built on the play area. She added that a public drop-in event was held yesterday and that the exhibition in the community centre would run for a further week so people could look at the proposals and pass on their views, comments and suggestions.